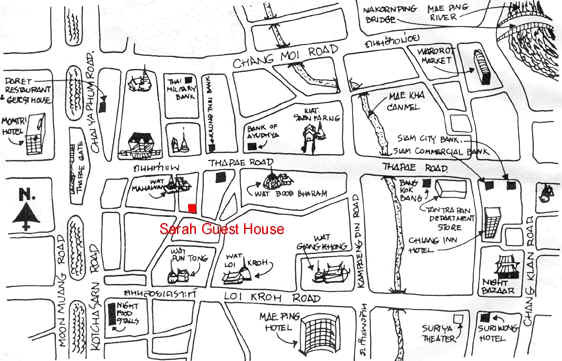 This map shows where Sarah Guesthouse is, in relation to the landmarks of central Chiang Mai. We are situated in the area between Thapae and Loikroh Roads, in a quiet residential area. Our location is excellent for visiting the Night Bazaar. It's only a short walk to many of the city temples; and facilities such as banks, money changers, internet cafes, restaurants and all kinds of shops, are only a short walk away. We are: - a 5 min. drive from the bus station. - a 5 min. drive from the railway station. This is our address in Thai. Show it to the taxi drivers when you reach Chiang Mai, so they know where you want to go. If you need the above details for when you get to Chiang Mai; then simply print out this page and bring it with you. If you want your friends to meet you at Sarah Guest House; then simply E mail a copy of this page to them. Please note we have only one guesthouse with no affiliates or partners. E mail this page to a friend: write their E mail address in the box, press "Send this URL" Then send the E mail which is already formatted.